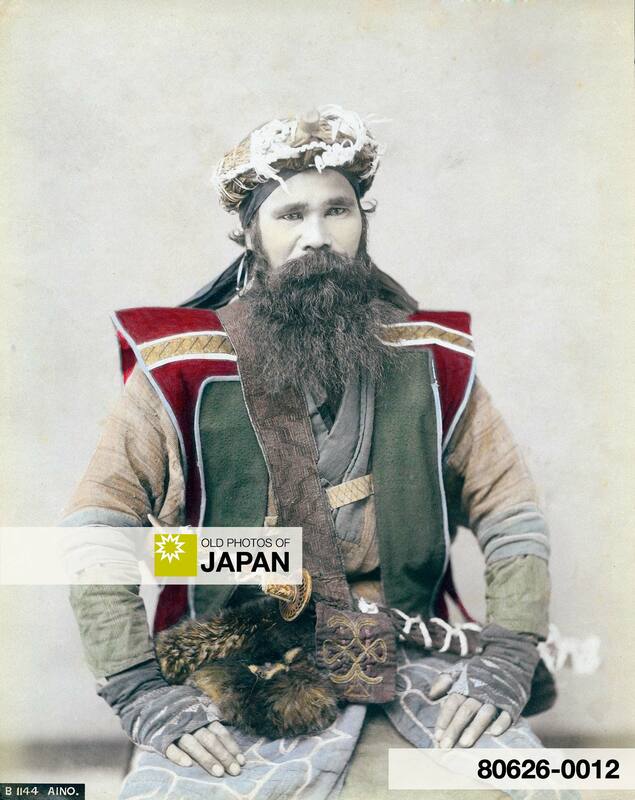 A beautiful hand-tinted portrait dating back to the late 19th century of an Ainu man in traditional clothing. He is wearing a sword in a shoulder belt and a ceremonial crown (サパウンペ, Sapaunpe) used during the iomante ritual and other religious rituals. Clothing for religious rituals differed from that for everyday use. Clothes for daily use was usually woven from the inner bark of trees, or made from the pelts of bear, deer, fox, seal, dog and other animals, as well as from salmon or trout skin. Clothes were also made of bird skin or plants. The clothing worn during religious rituals, however, was made of cottor or silk bought in trade with Japanese. The Ainu used very intricate patterns on their clothing, which were believed to expel evil spirits. You can also licence this image online: 80626-0012 @ MeijiShowa.com.